The Ultimate Technology UltimaTouch 5500 has been discontinued. No direct replacement is available. The UltimaTouch 5500, All-in-One Touch Screen PCs, are high-performance POS platforms designed for use in restaurants, convenience stores, and specialty retail establishments. With 850 MHz Celeron processor, 256MB RAM, 20 GB hard drive, 12.1" TFT touch monitor, 2 track MSR & Windows 2000 operating system. Includes power supply/AC adapter & tilting stand. With 850 MHz Celeron processor, 256MB RAM, 13 GB hard drive, 12.1" TFT touch monitor, 2 track MSR & Windows 2000 operating system. 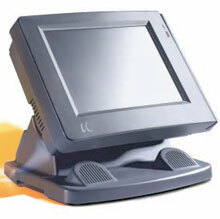 Includes power supply, tilting stand & customer display. With 850 MHz Celeron processor, 128MB RAM, 13 GB hard drive, 12.1" TFT touch monitor, 2 track MSR & Windows 98 operating system. Includes power supply/AC adapter & tilting stand. With 850 MHz Celeron processor, 128MB RAM, 20 GB hard drive, 12.1" TFT touch monitor, 2 track MSR & Windows 2000 operating system. Includes power supply, tilting stand & speakers.